In honor of distaff day, today I made my own wrist distaff. I used bits of wool left over from past knitting projects, old buttons, unpaired earrings, and little charms that have spoken to me in the past. And here it is in use, I had to test it right away! 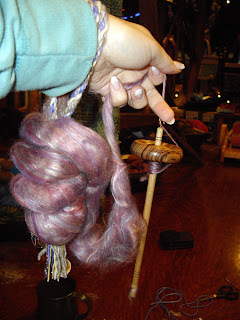 The guild in Duncan celebrates Distaff Day every year, and since as I will be at the shop and not able to go, I figured we should celebrate Distaff day and do a short workshop in the afternoon. As well, people are welome to bring their wheel, drop spindle and come spin!